But then to write you need to experience life.. and death… and the lambing season is all about that! When I tell people I have Cotswold sheep often people (some of whom should know better as they are farmers) say to me is – ‘But why? Surely all sheep want to do is die.’ And it is true that often when you find a sheep ill in the field, it is very ill indeed and will often die. But people shouldn’t forget a sheep is a ‘prey animal’ and this means their instinct to keep up with the flock, and look fine, and therefore not a target for any passing predator is immensely strong – so when you find a sick sheep, it is past caring and probably indeed near death. But she kept on going… one laboured breath after another… then in the evening I thought she had gone at last, and gently picked her up. At that moment she lifted her head and stared at me. She was fighting so hard to live; I gave her another feed, some more antibiotics and a painkiller. Half an hour later she was on her feet. And a day later she is feeding from her mum, and jumping round the pen like nothing was ever wrong with her. She might be small, but she really did fight for her life! 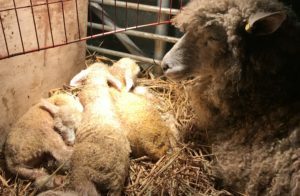 She wanted to live – she is definitely a sheep, which has no intention of dying! 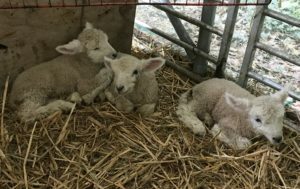 This entry was posted in General and tagged Cotswold Sheep, lambs, triplets. Bookmark the permalink. When Worlds Collide – How Weird Is That?